The story of the American West is the story of a relentless quest for a precious resource: water. It is a tale of rivers diverted and dammed, of political corruptions and intrigue, of billion-dollar battles over water rights, of ecologic and economic disaster. In Cadillac Desert, Marc Reisner writes of the earliest settlers, lured by the promise of paradise, and of the ruthless tactics employed by Los Angeles politicians and business interests to ensure the citys growth. 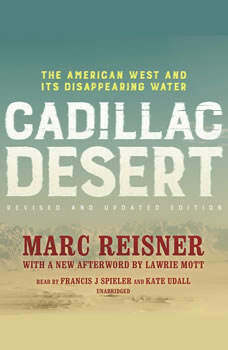 He documents the bitter rivalry between two government giants, the Bureau of Reclamation and the US Army Corps of Engineers, in the competition to transform the West.Based on more than a decade of research, Cadillac Desert is a stunning expos and a dramatic, intriguing history of the creation of Edenan Eden that may be only a mirage.